How we implemented a customers own design. This job was requested and designed by our client, who was a very keen gardener. However she had issues with her garden flooding and holding water. 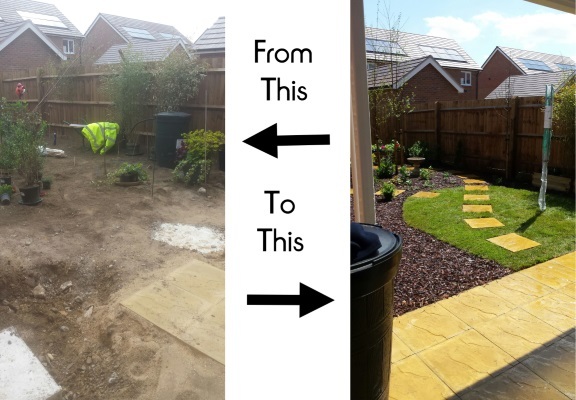 We removed the existing pathway and extended the patio. We created some beds and fixed up some trellis ready for the plants, which our client had either grown or purchased and trained herself. We laid stepping stones to give access to the garage and all other areas of the garden. We turfed a small area of the garden and continued planting the various plants as per our clients plans and instructions. The remaining areas were top dressed with chipped bark. The bench, wardrobe and compost bins were positioned on the patio. The job was completed exactly to our clients requirements, leaving her both overwhelmed and extremely happy with the end result. This project was run by Aaron our grounds supervisor, he was assisted by Kenny and Gareth. Another successful job and another delighted customer. Well done 'Team Create'. What a difference. Looks amazing.